New data released by the office of Sen. Jeff Sessions (R-Ala.), chairman of the Subcommittee on Immigration and the National Interest, reveals that the foreign-born population of the United States has grown more than fourfold – from 9.6 million in 1970 to more than 42 million in 2015. 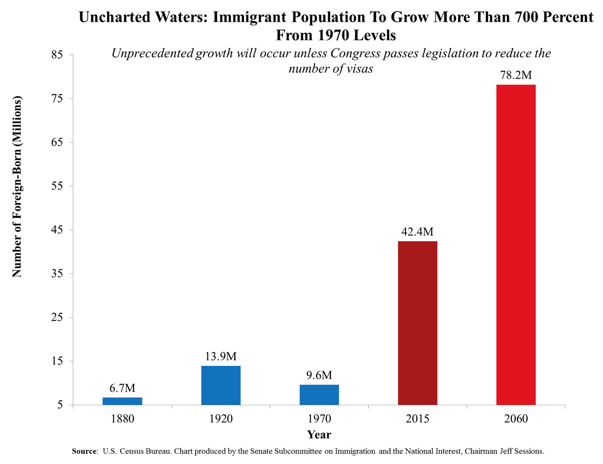 Unless legislated brakes are applied, surging immigration will drive the foreign-born population of the U.S. to 78 million by 2060 – a 715 percent increase over the 1970 baseline. By contrast, Sessions points out that even after the great wave of immigration during the late 19th and early 20th centuries, the foreign-born population topped out at 14 million in 1920 – about a third of its current size. As the chairman of the Immigration and the National Interest subcommittee observes, this unprecedented and unceasing wave of immigration is serving no identifiable national interest. Previous ArticleImmigration Hypocrisy At The UN: When Does Our “Xenophobia” Begin To Look Like Their Europhobia? 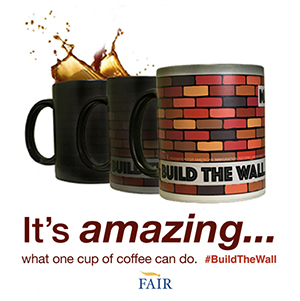 Pass Mandatory E-Verify to protect jobs for legal workers only and block visa overstayers and illegal aliens from working and they will return to their home countries. Put troops on the southern border..
Stop legal immigration…….we have no lands that need settled…….all legal immigrants do is flood into overcrowded cities……..and put strains on resources. End Temporary protected Status program that is not Temporary……We brought over 200K El Salvadorans here after an earthquake and they are still here….so much for temporary……. 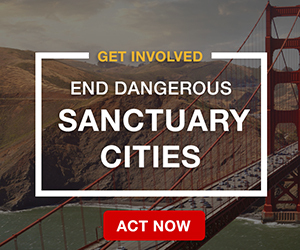 Make it a felony to enter the USA illegally or overstay a visa. It is a felony to reenter the U.S. following a formal deportation, unfortunately, we have a president who is not interested in enforcing our immigration or criminal laws. You are correct about Temporary Protective Status (TPS). You can visit the USCIS website and see how many foreign countries currently have TPS available to their citizens. The president grants TPS, and doesn’t go through congress. This amounts to yet another type of amnesty. I doubt very many, if any, ever return back to their native countries. 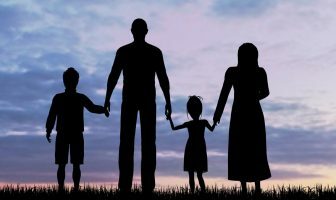 Beneficiaries of TPS will eventually find some way to gain lawful permanent residence in the U.S., many by fraudulent marriages to U.S. Citizens. Since Obama came in to office, just about all interior enforcement of immigration related laws has come to a halt. Obama encourages more, and more illegal immigration, by simply ignoring the growing problem. In fact, Obama enjoys the illegals. It really is a very sick situation for America. How did Americans elect this socialist twice!!! In an informative video made in 2010, the immigration to America is shown by gumballs. The apologists who claim to want to ‘fix the poverty’ (worldwide) is not even touching the surface in reality. Please watch the NumbersUSA presentation at: https://www.youtube.com/watch?v=LPjzfGChGlE. Then take in 3rd world poor overpopulation to destroy America, when we didn’t cause it. Illegals steal jobs from Americans. Illegals occupy rental housing, driving the cost of rentals up, up, up in every city in which they are common (most cities in the South and West, NYC, Boston, Washington DC, Chicago). They are criminals and do criminal acts here. 1-800-dhs-2-ice – turn in an illegal. Not only is it serving “no identifiable national interest”, it’s a huge negative for this country. 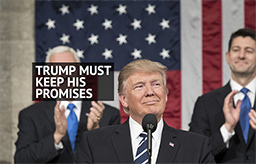 The facts are that immigrants, both legal and illegal, will end up receiving government assistance of one type or another over their lifetimes at rates far above native born Americans. That was not the case a hundred or more years ago because those programs simply did not exist. In fact, we attracted the adventuresome, pull yourself up by your bootstraps types, because they knew they had to make it on their own. Now we attract the welfare dependent in many cases. Those opposed to immigration in the 1800s were called the know nothings. The know nothings in this day and age are those whose views on the subject are based on cliches like a poem about “give me your poor” on the Statue of Liberty. Yes, those people were poor, but they made their own way, or, as up to a third did, returned to their home countries. Now it’s based on how fast they can get down to the welfare office.